Recommendations! Restaurant Radar! Rock & Roll! 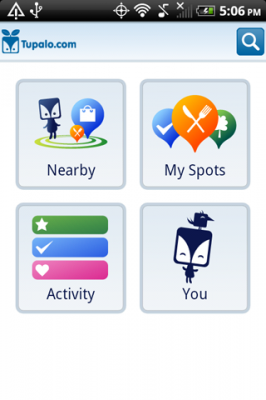 Tupalo.com proudly presents two tasty new features to spice up your local search life. FIrst up, for our logged-in users, ‘Personal Recommendations‘. Your Stream now gives you recommendations of where to go, based on your friends’ reviews and desires. Secondly, available to all users, our radical ‘Restaurant Radar‘. Just enter an address, and we’ll show you the best restaurants in the area. Finding places to eat has never been easier. The second official Tupalo Hack Week is over – and it was even better than the first. Accompanied by some fine music, our darkroom of developers bravely ignored hunger and sleep deprivation in their ongoing quest to give our users the perfect Tupalo experience. Among other things, our heroic coding kings made various tweaks to the site’s look and feel, wrestled with our soon-to-be-launched language versions (Klingon amazingly not present), and finalised our ever-so-useful Restaurant Radar. Ein großes Lob und ein riesiges Dankeschön an unsere treuen User, die uns gleich zu Anfang des Jahres mal schnell auf Platz 2 des ÖWA Rankings befördert haben. Vor nicht allzu langer Zeit waren wir noch gar nicht auf dem Radar der ÖWA, dann im August auf Nr. 4 (mit 1.4 Mio unique clients), im September auf Nr. 3 (mit 1.8 Mio unique clients)…na und jetzt – Nummer 2 mit 2.5 Mio Unique Clients! The week before last was Hack Week here at Tupalo HQ. Our dedicated darkroom of developers (that’s my copyrighted collective noun, by the way) put up their ‘Do not disturb’ signs, and hacked away until they could hack no more, powered by vast amounts of breakfast carbs, fresh fruit, coffee and lunchtime take-outs. The results were, as I’ve come to expect from my techy team-mates, mightily impressive. Highlights include a decidedly dynamic dashboard (for us to keep a better eye on ourselves) and a rather racy recommendation engine (to give our users even more top tips), both of which are already up, running and winning gold medals. And… we’re doing it all again next week. If you have any ideas for us to hack, please do let us know. It’s awards season! The 2011 Golden Globes ® will live long in the memory thanks to Ricky “The Roaster” Gervais – and now the Oscars ® are rushing into view. Headed to the Academy Awards ® show at the Kodak Theater? Tupalo.com will point you to the best bars, restaurants and hotels in the neighborhood. Attending one of the many Oscar ® charitable events being held across the USA? Our city pages, from LA to Las Vegas, from Denver to Dallas will point you to the best places in the vicinity. And talking of awards: around Oscars ® time, we’ll be awarding ourselves some (ahem) “TupalOscars” in recognition of our profitability and upcoming plans, when our tear-filled acceptance speech will inevitably include thanks to everyone from our parents to Ingmar Bergman and Marion Cotillard. So then, this post will have an obligatory sequel, but we promise that it’ll be more Godfather Part II than Matrix: Reloaded. With our international data and marketing partners, and our global community of Tupaleros, we’ve now crossed a crucial step and another milestone for Tupalo.com. 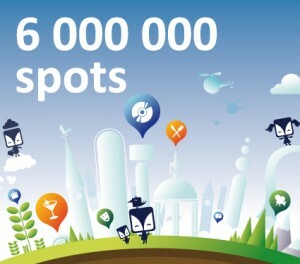 We now have our 6 millionth spot on Tupalo.com. Hooray! Having a broad range of businesses enables us to provide an even better service to you, our users. 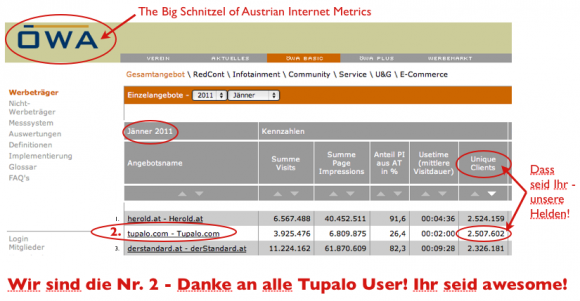 We started off initially as a niche service for vegans and their eating habits in Vienna, Austria, but now, after more than 3 years in existence, we’ve expanded Tupalo.com into a new generation of local discovery engine. We still like vegans and their eating habits, but we also think that it’s helpful to find a dentist in the neighbourhood or the best club in New York City. Those 6 million spots are now distributed among 6 european countries and the US. We’re still growing strongly and we’ll keep you updated about our next milestone. We are happy to announce a partnership with the world’s premier source for luxurious hotels – The Leading Hotels of the World (LHW). While Tupalo.com strives to provide a great local experience, we also believe it’s important to have a broad range of business listings available on Tupalo.com. At first sight LHW is not the typical Tupalo dataset, yet there’s a lot of people out there seeking basic information for luxurious hotels of any kind. Having more than 400 Leading Hotels of the World within Tupalo.com in areas such as Islamabad or Moscow on the one hand enriches LHW’s brand among young hipsters and urban people and, on the other hand, gives existing Tupalo users the chance to review those hotels, share them with friends or find out more about them by clicking on the link attached to the listing. Hi! I’m Constantin, one of the Software Engineers at Tupalo.com. I’ve just come back from this year’s Google Developer Day in Munich (pictures on Twitter), where I had the chance to listen to fantastic talks by Google Advocates and to meet other people in the Google Universe! One of the interesting things that got my attention was the support for speech recognition in the latest versions of Chromium. Paul Kinlan and his colleague Michael Mahemoff did a great job in showing off some of the new HTML5 features that Chromium and Chrome support! Since we love to try out new stuff that we think contributes to the experience of our users, we’ve added speech recognition to our search. If you happen to use the latest version of Chromium/Chrome, you should see a little microphone icon in the search field. Click on it and say what you want to search for! Just go to any spot or city page and try out “Speak to Search”. >> "This is a test string".simhash #=> "0100110001100001001100010000000010001001001000110110000010101100"